Saint Rose has done some amazing things over the Summer with the construction and completion of two new buildings: The Huether School of Business and the amazing Centennial Hall and its convenient store. I am proud to say that I am among the first group of students who get to live in this magnificent building! It is so nice and I will definitely be writing more about it in the future! For now, I wanted to introduce you all to the POD, or Provisions on Demand! The POD is a convenience store and burger place located right underneath Centennial Hall! I went in on the first day I got here just to check it out! When you walk in, there are two sides. The right has tables, as well as a frozen food section, drink station, create your own trail mix and groceries. I know that this part will come in handy during the winter months when I am just too lazy to walk to Price Chopper for a gallon of milk. The left side has the “Burger Studio,” and it smells delicious from the moment you walk in. 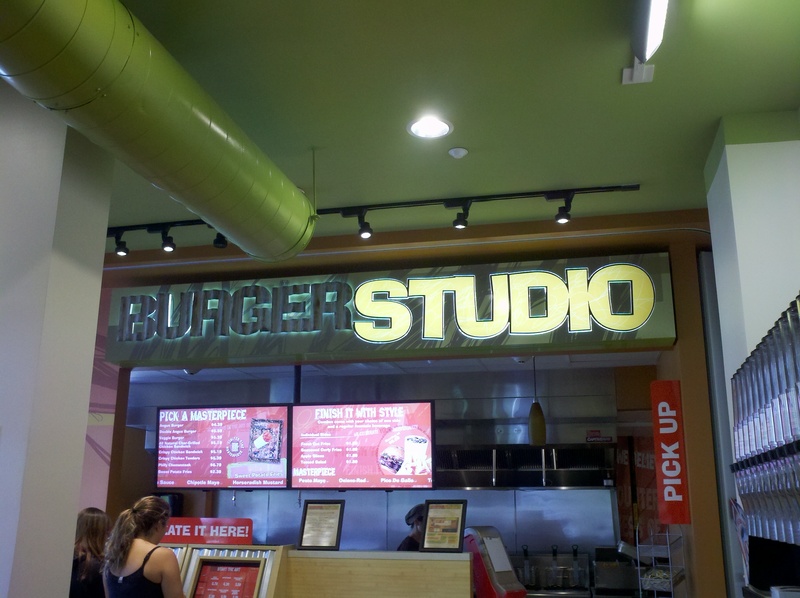 The Burger Studio located in the POD! 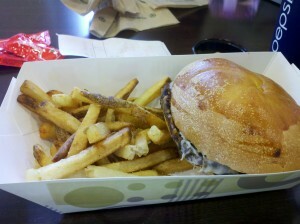 Deciding that I didn’t want to cook for lunch, I ventured down to the Burger Studio with some friends to grab food. I definitely wanted to see what all the hype was about because I had heard that it was good from various students. The coolest part of the POD has to be the touch screen where you literally build your own meal! When you hit combo, it shows you the options for the burger. You can choose from grilled chicken, crispy chicken, angus burgers, chicken tenders, and a veggie burger. Then you hit next, and from there you can choose your cheese, as many toppings as you want, and sauces! Toppings include caramelized onions, red onions, tomatoes, jalepenos, mushrooms, etc. The POD also has many sauces to choose from! I recommend the Bistro Sauce or the Buffalo Bleu Sauce. I know I left some options out, but hey! All that means is that you should go check it out for yourself if you haven’t already! For my first meal, I decided to go with the veggie burger. I got swiss cheese and an assortment of toppings with a side of fries. Their veggies burgers are the best on campus (sorry dining hall and Camelot, just saying it like it is). It was delicious, and since my first meal, I’ve been back there 3 times. They give you a huge portion of fries to go alongside your burger if you get the combo, and they have assorted drinks in the back! I would truly recommend the POD for a burger if you’re in the mood for one! Veggie burger and fry combo! Delicious!